Although physically absent from the 35th Kagyu Monlam due to his visit to the US, the presence and wisdom of the Gyalwang Karmapa were nevertheless felt as much as ever during the first teaching session on February 26. The Karmapa took up once again Potowa's Long Soliloquy, now in its third year, and the substance of the session revolved around inauthentic gurus. The session started with a photo of the Karmapa brought onto the stage in a procession. Shelri Rinpoche and Drupon Dechen Rinpoche were carrying the photo, which was installed on the throne to symbolise the presence of the Karmapa. Prayers and offerings induce the best possible mindset for receiving teachings, and traditionally, on the first day of the Monlam, the sponsors make up the procession for the Mandala Offering in 37 Points. 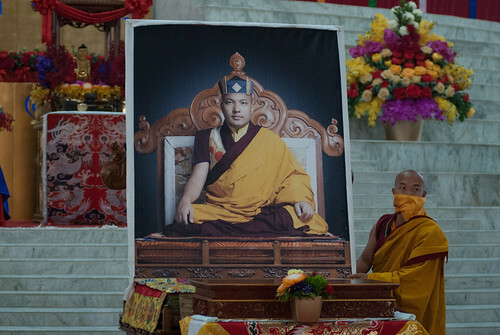 They placed the offerings before the Karmapa’s photo, and at the same time, money offerings were distributed to all the Sangha present in the Pavilion. The recitation then proceeded to the Supplication to the Lineage of the Bodhisattva Vow. During this session, and indeed throughout the day, the new female umzes [chant leaders] could be heard quite clearly. This is a first for the Kagyu Monlam, and was a particular wish of the Karmapa’s. There are two monks and two nuns leading the prayers this year, and the Karmapa specified that the microphones should be set up in such a way that there would be an equal distribution of sound between them. With the end of the prayers, the Monlam participants - the Sangha outnumbering the lay practitioners this time around - waited for the video of the Karmapa’s pre-recorded teachings to begin. When the image of the Karmapa came onto the screens, there was loud applause all around. His Holiness records the teaching each day and it is immediately sent over the internet, reaching India at about 5.00am. The teaching was in Tibetan, but with simultaneous translation into many different languages over FM radio. He started off by offering Gyaltsap Rinpoche, Yongey Mingyur Rinpoche, the khenpos, lamas, members of the Sangha from various monasteries, and members of the public from all around the world, his greetings for the Tibetan New Year of the Earth Dog, hoping that all might go well for them. He explained that the original plan was for him to be at the Monlam and that he had made efforts to do so, but that in the end he was not able to. He had shared his thoughts, and held meetings, and done his best, he said, and was now watching the live webcast (acknowledging that he had been slightly worried as to how it might be going). Gyaltsap Rinpoche and Yongey Mingyur Rinpoche, he commented, had given teachings during the Pre-Monlam which were so very profound and helpful, that even he had learnt a lot from them. He said thank you from the bottom of his heart to both Rinpoches. Because of the power of compassion of the previous Karmapas, I feel I can plant the seed of liberation in others. Therefore I am asking the lineage of the Karmapas for their blessings, and I will teach you this Dharma. Whatever Dharma you’re listening to, especially from the Kadampa masters, these are instructions that get right to the heart ot the matter, right where they need to. Like Tibetan medicine, they go where they need to heal. Whatever thoughts we have, these instructions point out our faults to us. So listen without distraction of body or mind. It is certain that actions and intentions always go together. The sign that their intentions are for this life is that their actions are to work on ambitions for this life. Those whose intention is a wish for emancipation do whatever will liberate themselves from samsara, and bodhisattvas do whatever benefit others. That is what they put into practice. We should act as is taught in the Dharma and teach it as we have practiced it ourselves. If we teach others without practicing it properly ourselves, we are like a leper practicing a garuda sadhana, and no one will come to listen. Elaborating on this quote, the Karmapa explained that, with samsaric motivations, our actions are done for the sake of this life. Conversely, if the intention is for nirvana, for liberation, then our actions will match that motivation: we will do whatever we can to free ourselves from samsara and from the partial nirvana of peace. If we practice the Dharma we teach, then we will be able to teach that Dharma we are practicing as we are experiencing ourselves. Otherwise if you don't act according to the Dharma you teach, it won’t benefit another person. You may teach them several long texts, they may experience a little bit of change, but even then, the Dharma will not work as an antidote, they will not feel disgust for this life. Then the student will start looking for the lama’s faults. They will say to everyone they meet, “I’ve studied all this Dharma and it doesn't help. That lama isn’t very good.” That is the fault of the lama who is teaching the Dharma. And the reason is, they say they are teaching from compassion, but that is not true. They are teaching with their mouths but their mindstream lacks Dharma practice. What they teach and what they practise don’t match. How can a student believe them, and gain certainty? Geshes give their attention to those who are of good birth, rich, assertive, ambitious, able to get things done, good at whatever they do, and highly regarded by their friends and relatives. But they say that those with faith who seek Dharma from a fear of death are greedy and unreliable. The Karmapa said that these days, people with good complexions, rich, assertive, very good at whatever they do, glib and easy to understand, they are the ones whom fake, unqualified lamas and inauthentic geshes consider good people, whom friends and relatives look up to, who are praised for many different reasons. By contrast, a student who has faith in the Three Jewels, who fears death, who remembers the Dharma from their heart, is treated by these unqualified lamas as though they had no brains, as useless, and friends and relatives consider them crazy. “He’s ineffective, shallow, and unreliable,” they say. In addition to not helping them, their relatives, families, geshes, khenpos, masters, gurus, and companions despise them and try to get rid of them. Assertiveness, wealth, ambitiousness, and being well-connected are antithetical to achieving enlightenment. Those who practice Dharma and are humble see profit, fame, possessions and sensory pleasures as enemies and faults. Geshes who consider those who have given up on this life to be incapable and will not help them, while paying attention to the wealthy, outspoken, and connected, are not true spiritual friends. Being able to get things done is being able to get things done for the sake of this life. Being wealthy is having wealth and possessions in this life. All of these are linked to this life. For such people, all their desires are for this life. For someone who has given up on this life, there’s no getting things done for the sake of this life. If you are someone who really thinks from their heart that you want to practice Dharma, you view popularity in this life, and wealth and prosperity in this life, as an enemy. You see them as faults. Lamas who do not accept those who put any wishes for this life out of their mind, but who accept those who have wealth and resources, who have influence, and give them Dharma teachings and instructions, are not true lamas. They are not authentic. An authentic spiritual friend, as described, “Teaches beings the Dharma without material offerings.” Thus they should pay attention to those who practice Dharma properly. A good monk is someone who is fearful of death, diligent, uninterested in this life, and intelligent, and who trusts the Dharma fully. This is because we are fleeing samsara and accomplishing perfect buddhahood. We have faith in the Buddha and seek the Dharma. Those who are very assertive, competent, and ambitious are going further and further away from buddhahood. Thus becoming skillful from today onward in the methods of progressing to buddhahood itself is what we should call ambition. That is what we should call assertiveness. That is what we should call being good at what you do. In terms of a practitioner, that is also being learned. That is being venerable. That is also what is called being a good master. That alone is the method for achieving buddhahood swiftly. That is the abhidharma. That is the sutras. That is the vinaya. That is listening, contemplating, and meditating. That is also bringing together all the arduous austerities and all your capabilities to accomplish buddhahood. All the sutras, scriptures, and classes of tantra from The Verses on the Vinaya up to Guhyasamaja are Dharma for a single individual. They were taught with specific times and stages in mind; there are none that were said to be unnecessary. An authentic spiritual friend or guru, the Karmapa said, whether or not someone can make offerings, when that someone is an authentic student, who studies and practices the Dharma properly, the guru will accept them with compassion, teach them, and take care of them. Offerings will not be important. To practice true Dharma, the Karmapa advised, you must identify your own faults, and fix them like curing an illness; finding where the problems are in order to eliminate them. For the Karmapa, the way Potowa understood a good practitioner is as someone who fears death and is diligent not to waste this life. Someone, in fact, who is not interested in this life. And the Karmapa believed it also meant someone who has faith in the Three Jewels from the bottom of their heart, because without that faith, he questioned, why would someone practice Dharma? They don't need buddhahood. Being rich is what they want and what they need. They have no desire or enthusiasm for enlightenment, and for this reason they are very far away from accomplishing buddhahood. The Karmapa explained that ‘assertiveness’ in Tibetan means arguing well for yourself. For example, when looking for a lawyer, people would choose someone who would be well-spoken, persuasive, and able to refute others. But Potowa, he said, thinks that we should understand assertiveness in terms of the Dharma as someone who realises that there is no happiness in samsara, who does not consider what other people think important, and who is able to put this life to one side. That concluded the first teaching, and the Karmapa waived the short meditation, since many meditation instructions had been given in the Pre-Monlam teachings. Gyaltsap Rinpoche carried out the recitation of the Dedication for the Living and Deceased, and at the end of the Aspirations for the Teachings to Flourish, the photo of the Karmapa left the stage with its procession.